It's been so long since we've had a real Christmas tree that I had forgotten how much I loved the scent. It really puts me in the Christmas spirit! I opened my shipment from Hilltop Christmas Tree Farms and found the most beautiful, full, real Christmas Classic Wreath. It smells so wonderful! It's beautifully made, very thick with foilage, a full 24" across, and is topped off with a gorgeous red and green tartan bow. This balsam Christmas wreath makes me so happy and nostalgic. Now I'm wishing I had ordered one of their real Christmas trees to be delivered here. They offer lots of beautiful wreaths to choose from, in sizes 24", 28", and 32" with a wide variety of bow colors to match your home decor. I am absolutely thrilled with my Hilltop Christmas wreath and highly recommend them! Hilltop is a family run business delivering fresh aromatic Christmas Trees direct to your door throughout Continental USA and Canada. You choose the date, they harvest your tree, and UPS will deliver it right to your door! Find out more about their Christmas tree delivery service HERE. Order by December 13 for Christmas delivery! 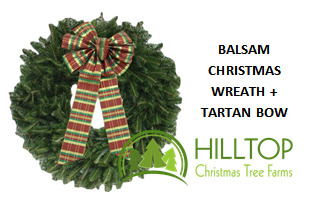 Hilltop Delivers Christmas Trees, Wreaths, Garland and More!